ENSINGER Penn Fibre is the nation’s number one manufacturer of thin rolls of nylon, acetal, or other engineering and high performance plastics produced in rolls (coils) of plastic – slit to customer width (strip) requirements and or cut to desired length. Thickness from .010” to .125”. Widths from .250” to 24”. We stock master rolls of plastic so we can slit and ship most orders in four days or less. Nylon rolls, MDS Nylon rolls, Acetal, and Delrin rolls, Delrin AF rolls, polypropylene and polyethylene rolls, PBT rolls, vulcanized Fibre rolls are held in stock as master coils for slitting strips to customers’ width requirements. 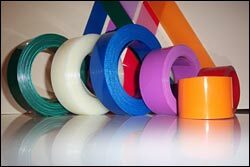 HIPS, PTFE, Fibre, UHMW and Specialty Materials are stocked as plastic rolls and slit to specified widths – as ordered. Thicknesses range from .010” to .125” Maximum. 16” Cores are standard. 3” and 6” upon request. Slitting deliveries are generally 4 days or less for the above stocked items based on master plastic roll availability (90%). Out of stock items – 2 / 3 week deliveries. Three to four weeks for most non-standard items. Average minimum order for non standard strip products is 250 pounds. © Copyright Penn Fibre, Inc.